I hope everyone had a great long weekend! My weekend was good, albeit, very uneventful. As it turns out, an uneventful weekend was exactly what I needed. I went to the mall on Saturday and was pleasantly surprised to find that it wasn’t busy. I guess everyone (except me) decided to head up to the cottage for the long weekend. Oh well! Having just posted a round-up of Summer Staples Under $50, I was on the hunt for some good end-of-season deals. As you may have seen on Instagram, I went a little bit crazy at Bench. They had an additional discount off their sale prices, so I couldn’t resist picking up a few pieces. Additionally, on my way out of the mall, I decided to stop by the Gap. It was a good thing I did, because these jeans were just waiting for me to bring them home. They were under $25 after discounts! Seriously, you need to try Gap Destructed True Skinny Jeans. They fit like a glove and come in a ton of great washes! Yes, these Gap destructed true skinny jeans were a bargain, but I also love that they’re ripped to perfection. It can be hard to find a pair of jeans that have rips, without being too ripped, you know? When it comes to denim, the fit is always important and Gap jeans tend to fit really well. I just wish I remembered to take a few shots of these jeans from behind, so you could see how cute they look on my bum! Oh, and yes, I’m wearing another off-the-shoulder top. 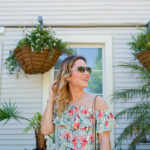 Ever since discovering this trick, I’m hooked on the off-the-shoulder style! Where do you like to buy jeans? Do you prefer to save or splurge on jeans? Those jeans have the perfect amount of distress in them. They also look amazing on you! For under $25, that is practically free! That top is perfection!! One of the things I am missing most while being pregnant is cute short tops like this. Those jeans look great on you! Thanks!! Maybe you can’t wear the short tops right now, but your outfits have been SO on point! These jeans are killer on you, doll! 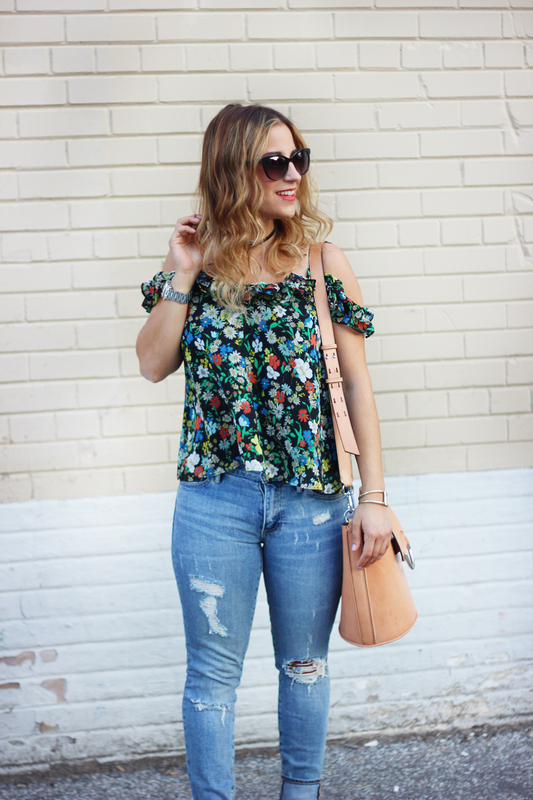 And I love that cool floral top- so breezy! What a fun top! Love it paired with that gorgeous bag (which is the perfect size too. I wonder if Banana still has any left?). I’m a complete GAP girl when it comes to jeans. They fit so well & look great as is clear in this post! Love this casual chic look! The jeans are on point! Love the pair of jeans on you! 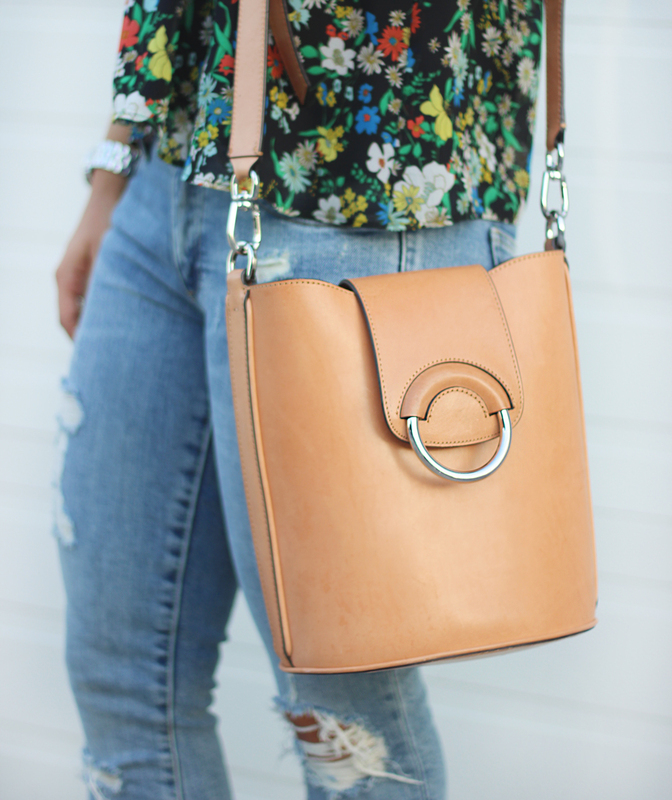 I can’t figure out what I love more, that cold shoulder top or your bag! I need this outfit!! 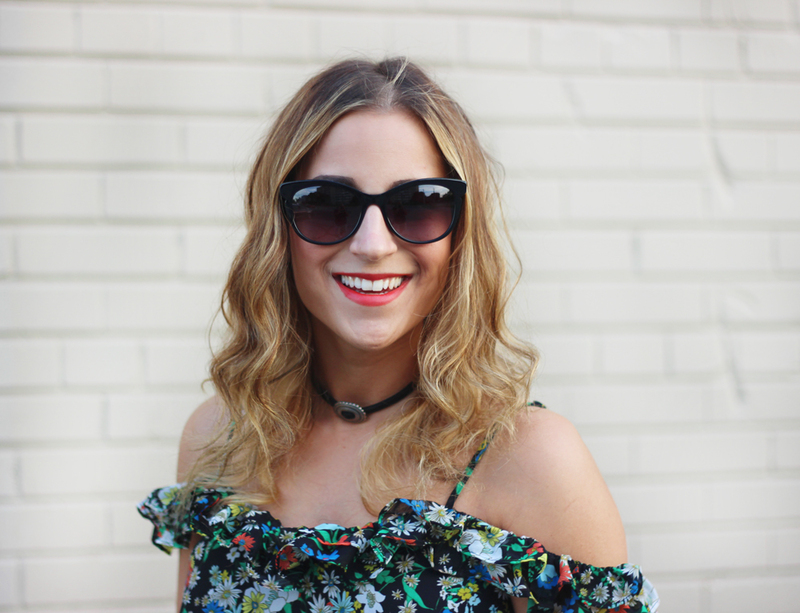 That top is gorgeous on you, and it’s perfect paired with your choker! those jeans look amazing on you!! I’m going to look at Gap in September for jeans (I’m going to actually do a month of no shopping in August – so far so good…its day 2). I am seriously in love with this top! And you are totally pulling off that choker trend! Those jeans are amazing! I would spend more money for something high quality, lots of the cheaper jeans I have bought just don’t last as long! 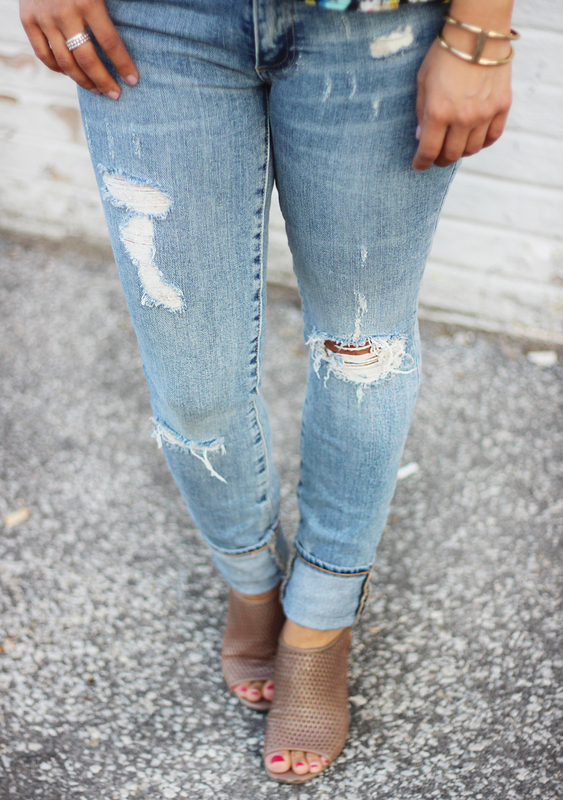 These are the perfect ripped jeans! Such a cute look! 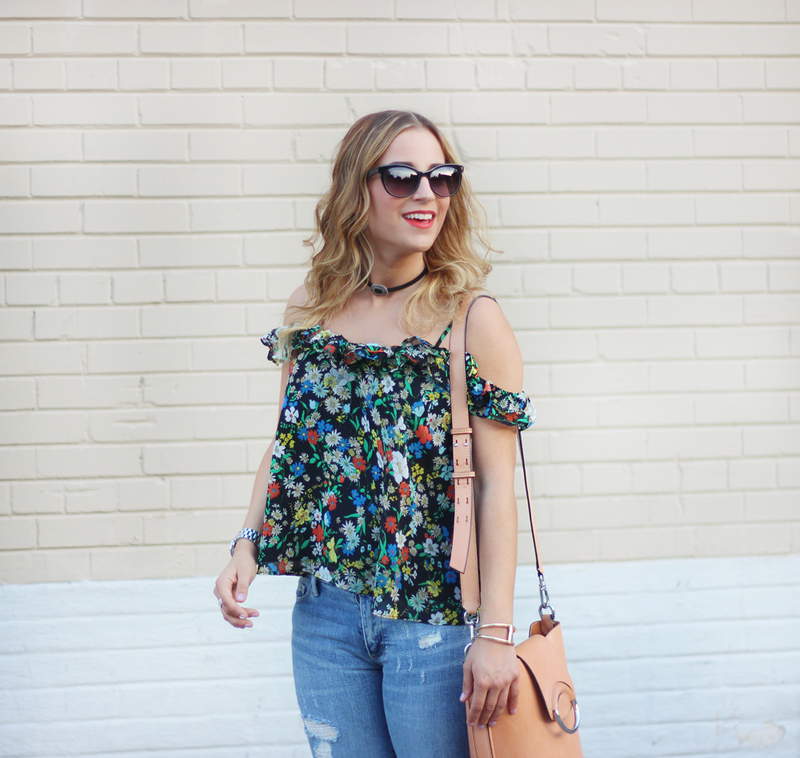 I’m loving that floral off the shoulder top, too! Sometimes, an uneventful weekend is a necessity – And at least you managed to snag those awesome jeans out of it! LOVE the blouse and those shoes!! 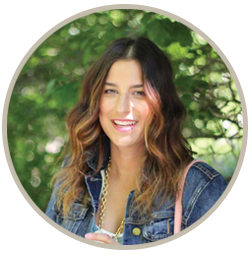 The pattern and style of your top is perfect! I like to shop for jeans at Topshop or Urban Outfitters as the fit is usually spot on. Yes, those jeans are ripped to perfection! LOVE them! The top is super cute. Love this whole outfit! Those Jeans!! !